For nearly 30 years, this group of professional musicians has shared their passion with the Fox Valley area. Learn how you can see their performances this Christmas season, and beyond. Roughly 75 musicians – all volunteers – make up the Fox Valley Concert Band, which has performed in the Fox Valley region for 30 years. When audience members listen to a talented concert band, they expect to hear a balance of sounds from the array of instruments. What they may not realize is just how important balance can be – not just in the music, but in the organization as a whole. 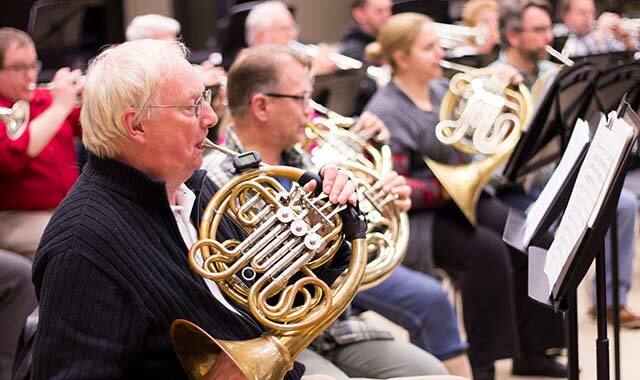 Balance is essential to the Fox Valley Concert Band (FVCB), a nonprofit group of roughly 75 volunteer performers who play free concerts around the St. Charles, Geneva and Batavia area. Whether in the auditorium of the Norris Cultural Arts Center in St. Charles, the community room of a nursing home, or the Wheaton Band Festival, the goal is the same: to provide a quality music experience. FVCB began in 1983 when local musicians decided the region needed a true concert band, one that performed year-round – unlike the practice of other community bands then in existence. What started as a group of 40 musicians has nearly doubled in size, with members hailing from more than 30 suburban communities and various backgrounds. Young professionals sit next to recent retirees, who sit next to undergraduate students, all of whom have passed an audition. All members are volunteers, with the exception of a paid musical director. This eclectic group is still driven by its original mission: to provide opportunities for musicians to grow, while at the same time providing area residents the opportunity to listen to the best in concert band repertoire. FVCB’s playlist encompasses a variety of tunes, from marches and show tunes to lighter classical and contemporary works. The conductor must continually find the proper equilibrium between new, energetic players and older members with vast experience; between traditional and contemporary pieces; and between the band and the audience. The FVCB performs annual fall, winter and spring concerts, plus special Christmas-themed concerts, mostly in and around St. Charles. It also provides a regular summer concert series. No matter the setting, the band strives to reach its audience in new ways. Holman has commissioned new works for the band and, many times, the FVCB has provided first performances of special pieces. Yet, the band remains grounded in its history, as well. “I think that one of the things we’re able to do is to maintain the tradition of the American concert band – that has a 200-year-plus history of bringing music to communities. But, we’re also a vibrant ensemble that plays new music,” Holman says. Scharf credits Holman with developing a strong balancing act between director and musician. Part of the community’s support includes financial assistance, which comes from sources including private and corporate donations, the City of St. Charles and the Illinois Arts Council. But just as much as the community supports FVCB, the band invests itself back into the community. One of Holman’s favorite investments involves the band’s work with student musicians. Each year, FVCB performs with a local school’s symphonic band or wind ensemble. The two groups sit side-by-side and play several pieces together. Further encouraging young musicians, FVCB also sponsors a youth internship in which talented high school students can audition and, if selected, rehearse and perform with the band. Each intern receives a small stipend that can be applied toward lessons, instruments or other musical education development. The band also makes itself available for local bookings, either as a full or smaller ensemble. Board president Scharf spends much of her time filling up the band’s calendar with additional events. Still, she always wants more people to discover the band. This entry was posted on Wednesday, November 26th, 2014 at 12:00 pm	and is filed under Arts & Entertainment, Top Posts. You can follow any responses to this entry through the RSS 2.0 feed. Both comments and pings are currently closed.